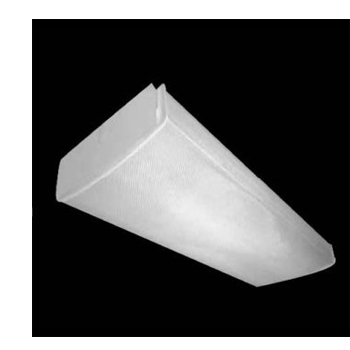 The 7800 Series specification grade glow end wraparound is ideal for corridor, office space, supermarket and conference room applications. The 10” wide unit is available in a two-lamp configuration, T8 and T5. 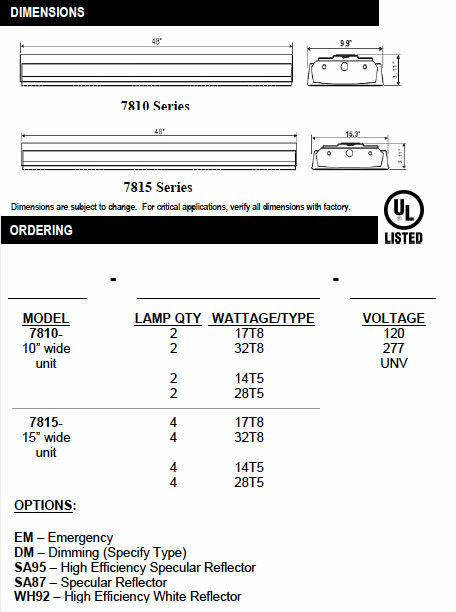 The 15” wide unit is available in 4 lamp configurations, T8 and T5. A .125 thick clear acrylic prismatic bottom section, in conjunction with linear side prisms and injection molded “glow” ends control glare and increase visual comfort. Integral embossed white end plates with flush knockouts make fixtures suitable for individual or continuous row mounting. Diffuser hinges from either side for ease of maintenance. For surface or pendant mounting. Die formed heavy gauge steel with leveling embossmetns, which allow direct mounting on most combustable low-density ceilings. .125 thick, P12 acrylic prismatic diffuser is standard. All parts finished with high gloss baked white powder coat with 89% reflectance applied over iron phosphate pretreatment for maximum adhesion and rust resistance.